Give your little one the kitchen of their dreams and watch them play chef at home and have a ton of fun with the My Life as Kitchen Play Set. The My Life as Kitchen Play Set is all your kid needs for countless hours of creative and imaginative role-playing fun that's sure to help grow and learn during this important developmental time. 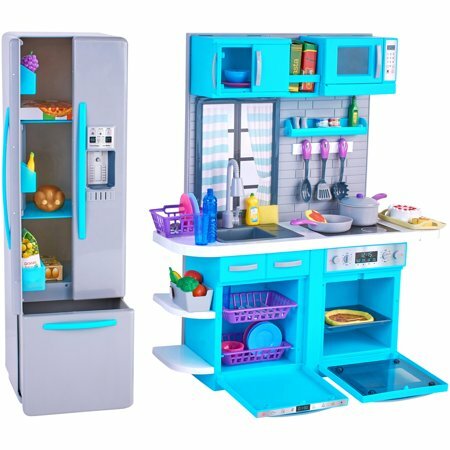 This complete set includes everything needed for some pretend kitchen fun, including a kitchenette, refrigerator, bacon, bananas, broccoli, dish drying rack, pancake, orange, saut&eacute; pan, pepper shaker, spatula, spoons, dishwasher racks and much. much more! Designed for use by ages 5 and up, the playset encourages the development of fine motor skills, hand-eye coordination, imagination and more. 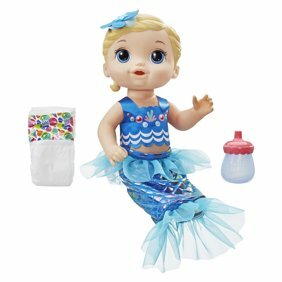 It is perfect for any little one who loves to help in the kitchen and is sure to make an ideal addition to any playroom, nursery, kid’s bedroom or other place your little one needs some stimulating fun! Pick up the My Life as Kitchen Play Set today and watch your little one's face light up with joy! Give your little one the kitchen of their dreams and watch them play chef at home and have a ton of fun with the My Life as Kitchen Play Set. The My Life as Kitchen Play Set is all your kid needs for countless hours of creative and imaginative role-playing fun that's sure to help grow and learn during this important developmental time. This complete set includes everything needed for some pretend kitchen fun, including a kitchenette, refrigerator, bacon, bananas, broccoli, dish drying rack, pancake, orange, sauté pan, pepper shaker, spatula, spoons, dishwasher racks and much. much more! Designed for use by ages 5 and up, the playset encourages the development of fine motor skills, hand-eye coordination, imagination and more. It is perfect for any little one who loves to help in the kitchen and is sure to make an ideal addition to any playroom, nursery, kid’s bedroom or other place your little one needs some stimulating fun! Pick up the My Life as Kitchen Play Set today and watch your little one's face light up with joy! My girls received this for Christmas and they absolutely love it. My kids get bored with stuff very quickly but not this. I was surprised at how well made the refrigerator is. I love that you can change the scenery in the window. All the food pieces are nice. The burners on the stove make noise. The ice dispenser on the fridge makes noise. There's so many pieces to this set. Anything that can keep my girls attention as much as this does is worth my money. Great, but damaged prior to shipping!